With another NHL Lockout underway, most hockey fans have become tired of the stale debates between the millionaires and the billionaires. Who’s to blame? At this point, the majority of us don’t care who’s right or wrong, we just want the season to start. 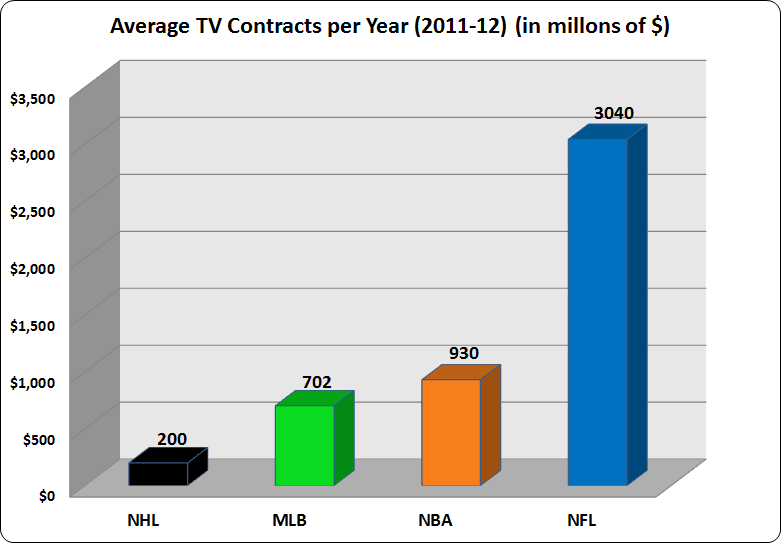 The bigger question remains, can NHL revenues even sustain the current player contracts without a new collective bargaining agreement (CBA)? Going back to the early 90’s, it is incredible what less than $9 million bought you back then when only the top players were paid the highest salaries. Today we have good but not great players making more money than today’s Superstars. Imagine if back then Tony Granato was paid more than Wayne Gretzky or if Geoff Courtnall was paid more than Brett Hull. Laughable and unthinkable don’t you think? Yet this is exactly what is happening in the current NHL. There’s a big difference between Superstars and very good or average players which is not always measured just by their performance on the ice. Player marketability and how much value they bring to the team and the league is an important factor when negotiating contracts. The Los Angeles Lakers don’t pay Kobe Bryant ~$28 million a year just to shoot hoops, it’s a business decision. In fact, some financial experts believe that Kobe is actually underpaid for the overall revenue he generates to the team and the NBA overall. The same can’t be said for the majority of the NHL’s current top paid players. Has the average person even heard of Ryan Suter, Zach Parise, Tyler Myers, Christian Ehrhoff or Brad Richards? Yet these are some of the NHL’s top paid players. How can signing players to contracts that they can’t possibly meet or exceed performance wise on and off the ice be profitable long term? The only players who should be paid the highest contracts are the Top Superstars (Crosby, Stamkos, Malkin, Ovechkin), who are most likely underpaid thanks to the now expired collective bargaining agreement (CBA). Even when their performance starts to decline as in Alexander Ovechkin’s case, they can still provide revenue in terms of TV ratings and merchandise sales. Evgeni Malkin’s contract at $9 million a year looks like a bargain right now considering he is the current MVP of the NHL. 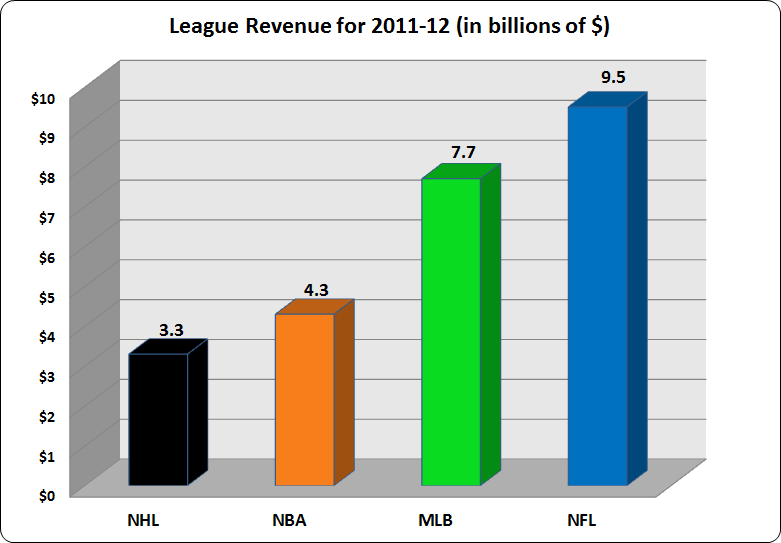 What most people find surprising is that the average NHL player salary is higher than that of the NFL even though the NFL has the highest league revenue of any sports league. How can that be? The NHL has 23 players per team and the NFL has 53 players per team so naturally there are more players in the league that have to share the revenue pool. 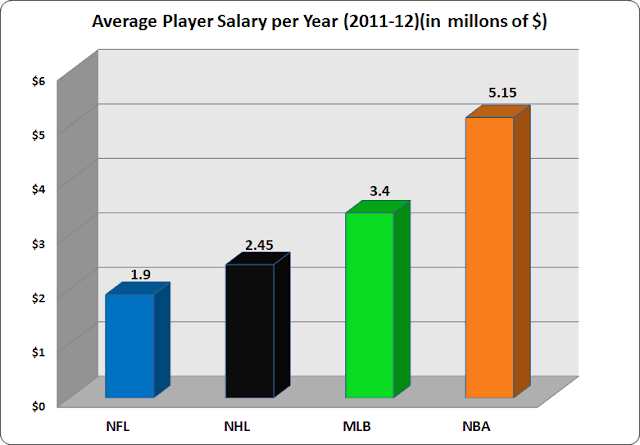 Meanwhile, the NBA has the fewest number of players per team which is why it also has the highest average player salary. A better comparison to the NHL in terms of roster size is MLB, (23 vs. 25). 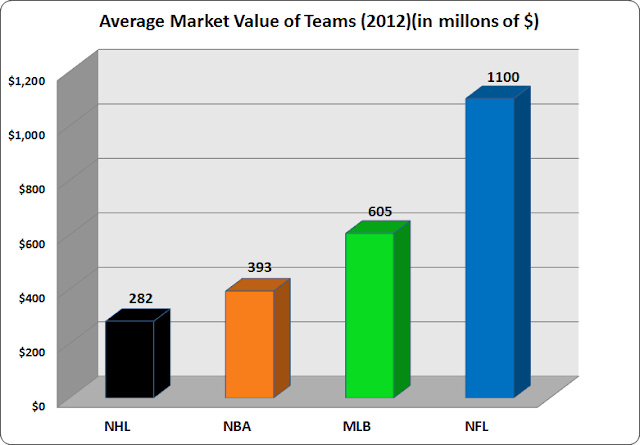 Even though MLB had revenues of $7.7 Billion in 2012 vs. $3.4 Billion for the NHL, the average player salary was only $3.4 million a year for MLB compared to $2.45 million for the NHL. You don’t have to be a stats professor to realize that NHL players are paid a higher percentage of revenue compared to players in the NBA, NFL and MLB. Revenue sharing is the biggest issue in the current NHL lockout, with players receiving 57% of hockey-related revenue while 18 out of 30 NHL teams supposedly lost money. It's no wonder the owners want to negotiate a new collective bargaining agreement. In the recent NBA and NFL lockouts, players in both leagues agreed to approximately 50/50 revenue sharing plans. So why should the NHL be any different? 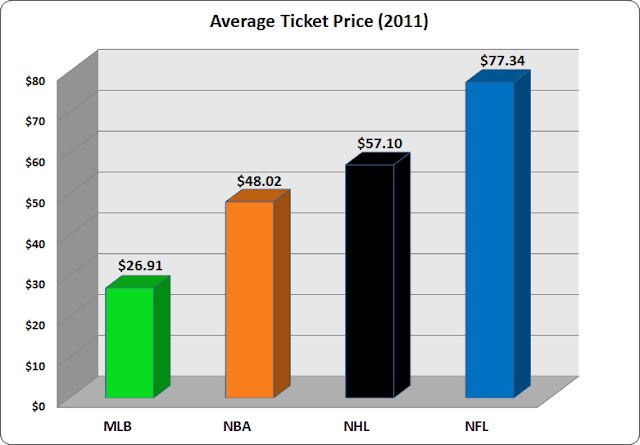 Since NHL ticket revenues account for around 50% of overall revenue you would think that the owners and players would try to do everything possible to end the lockout and not alienate or upset their loyal fans. If NHL fans really wanted to teach the players, owners and Commissioner Bettman a financial lesson, they could just stop attending future games which would make a significant impact on the NHL’s economic bottom line. But NHL fans are more “talk” than action as seen by the attendance figures following the previous lockouts in which the average attendance actually increased. Therefore the league has no qualms in continuing this lockout because they know fans will be back whenever games start again with their wallets open. At this point, the only true losers in this lockout are the average folks who work in NHL arenas, the referees and small businesses that rely on extra revenue from NHL games.